There are rumblings around the pork world right now. It has been the topic of many dinner conversations, and part of what keeps us up at night. How did we get here? Low markets, overproduction, tariffs, ASF. It’s discouraging. No one wants to see markets struggle. But I think it is also important to look to the past and be realistic, not reactionary. There are a few factors that got us to where we are today, and I think that to move forward it is important to unpack how we got here. Tariffs and the concept of trade wars have been all over the news lately. However, I do believe that even without the tariffs we would still be in a low market situation, based on our higher production compared to shackle spaces and exports. Ideally, we would be in talks with China or already making a deal with them. However, it seems that the current U.S. administration plans to wait it out. In reality we have been on the bad side of exports with them for a long time, so even though their retaliation is hitting us hard, pork markets are subtly benefiting from the lower grain prices. As frustrating as the situation is, we’ve experienced this roller coaster effect before, and there usually isn’t just one cause behind it. For instance, we ship a lot of grain to China. We ship grain all over the world to feed other countries’ livestock, instead of feeding our own and then shipping out the meat. Bottom line, we can ship 3 pounds of grain or 1 pound of meat. From an environmental standpoint, it probably makes more sense to ship the meat. But sadly, people aren’t talking about this. With all signs pointing toward 2018 being a positive year, we dove into production mode. We geared up for the promise of increased exports and more packing plant space, but then everything slowed down. However, with more packing spaces coming online this fall and into early next year, we can be encouraged by the potential to increase markets by increasing the amount of animals throughout the plants. That’s the downside of business. In time, more space will become available. Some are looking at double-shifting, opening new facilities, and expanding. Their space has been profitable in recent years, so the cash is there for them to expand. While it is hard to resist the temptation, now is not the time to unnecessarily decrease stock. Especially not knowing what the international markets will do given the presence of African Swine Fever in many countries. ASF has been negatively affecting the markets in China for the past few weeks, and in Eastern Europe for several years. Thankfully, in North America we have been given the gift of time to prepare for this disease. While it is good to be cautious and prepared, panicking does us no favors. I believe that our concern should stem primarily from the goods being imported from countires with swine diseases that would be devastating to the US pork export market. To maintain a contamination-free system in the U.S., we need to start producing more of our own products, or finding alternatives from ASF free countries. For example, we’re shipping out soybeans to China and importing soybean products, vitamins, and amino acids back into our system. We are shipping out meat and intestines to China, only to have them clean the intestines and ship them back to us for our use in food products. Reducing that exchange is essential to managing the risk of ASF in our market. Each operation should do the research and decide for themselves what their approach will be, but the market as a whole needs to work on reducing the need for foreign products so that we are better prepared for catastrophic global events such as ASF. While it’s certainly bad for the industry and bad for those countries, in the short term, it could be helpful for prices in the U.S. For now, we’ll have to see how it unfolds, and simply do all we can to prevent its spread here. In the long run there is good in this. The threat of disease helps us get more prepared, and it’s better to think about it now instead of being surprised later. As markets become more and more globalized, the truth is, it’s likely a matter of when and not if, ASF will hit the U.S. The greater the presence it maintains in different countries, and the more the live virus spreads, the higher the risk. Our goal should always be to keep the industry safe and strive for improvement. And, as always, we need to get more people around the world eating pork. Thankfully the data shows that this is already happening. I believe that if we play our cards right, we should be in a position to move forward with even more expansion in the future. And from my years of experience in the industry I've learned as far down as we go, we always seem to come up on the other side. Tim Friedel is the General Manager of Thomas Livestock in Broken Bow, NE. 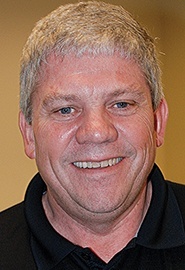 He is a well-respected voice in the swine industry and advocates for better animal husbandry and increased use of technology to support barn staff. Curious to hear from other experts in the industry? Subscribe to our blog where we are always updating you with content relevant to the hog and turkey industries!